If you need a quick, healthy, and delicious snack that will satisfy the pickiest eaters in your household, it’s time to try green things. You’re probably thinking: what are green things? We’re referring to leafy green vegetables, like kale and collard greens, slowly dehydrated in the oven with a little olive oil and salt. These crunchy veggies offer a fun way to eat your greens. 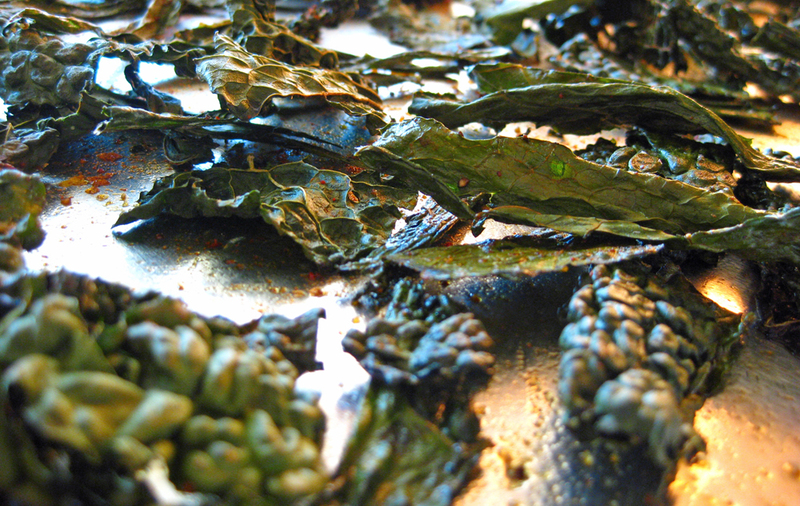 If you haven’t had leafy green chips before, this is a must try. The leaves dry out in the oven and become brittle and crunchy instead of chewy and tough. With the addition of a little salt and smoky paprika, the flavors deepen, tasting like the delicate leaves have been slow roasted. In addition to our oven toasted “chips,” we’ve recently rediscovered an all-time favorite American snack-food: popcorn. In spite of all the kernels that have been popped over the years, it’s one of those snacks that we haven’t embraced, until now. The air popcorn maker we own is a super cheap one that we bought for the purpose of popping corn that we then used as packing material (just another one of our dirty hippie tricks). Cheap works for popcorn poppers, and if you prefer to pop in oil, a pan and a little oil on the stovetop works well and costs pennies. In the last couple of months, we have pulled out the air popper and started trying out a variety of flavors and spices on our popcorn. A little olive oil, salt and pepper is delicious. Add a bit of freshly grated Parmigiano cheese, even better. We’ve even had the occasional sweet tooth that requires something a bit more decadent than salt. Jason recently made a nice maple crunch popcorn that we couldn’t stop eating. Our favorite flavor, so far, comes as a result of an experiment with the green things described above, crumbled and added to a bowl of fresh popcorn. The result is a wonderful, complexly flavored crunchy snack that is packed with nutrients. Preheat oven to 250 – 275 degrees. Wash the greens and remove the stem. Spin the greens dry in a lettuce spinner. Lay the greens out on a baking sheet, or two, trying not to overlap the greens. Drizzle a little olive oil over the greens and toss with your hands. Sprinkle salt and paprika and bake for about 12-15 minutes, checking and rotating the pans every 5 minutes. 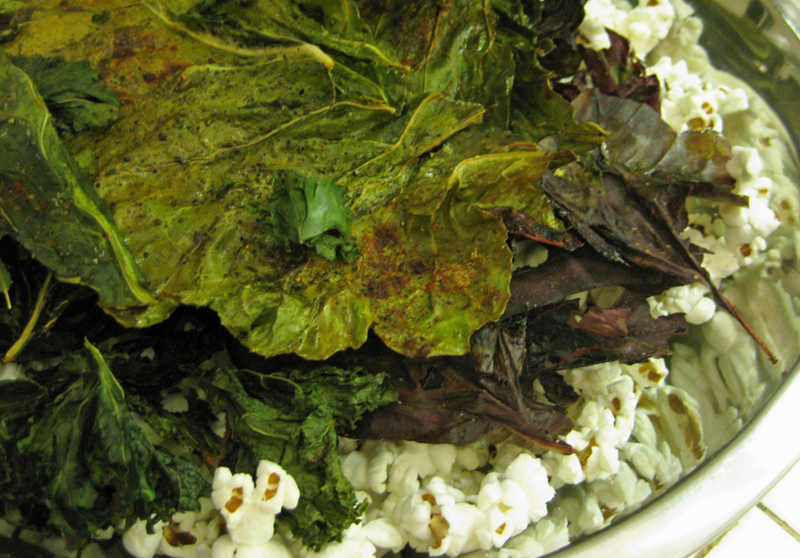 Pull out of the oven and eat as chips or toss the chips in a bowl with air popped popcorn. Hi Kristin: Your presentation on Simple Kale is elcxelent. After watching every bit of you in culinary action, you succeeded in making me salivate for simple kale. The fact is that I had not enjoyed kale, simple or otherwise in recent memory. At my age such memory (recent) could be at least thirty years.You appeared very sweet and adorable on TV, as in real life. The usual expert doing a food presentation is grossly overweight, double chin (of course) and speaking in halting English. Not Kristin; you broke the mold. There was much accomplished,I am looking forward to much more to come.